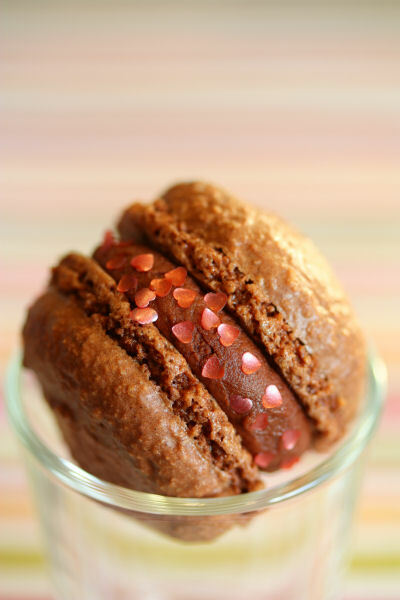 Cherrapeno: Chilli Chocolate Love Macarons! Love is in the air as the theme for this month's Mac Tweets challenge is to make Valentine macarons, as V-Day is almost upon us! I chose to make chocolate macs. Chocolate? 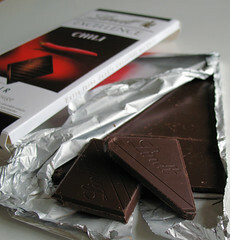 Yep - check out my 'chocolate law' which you should abide by on 'that' day! 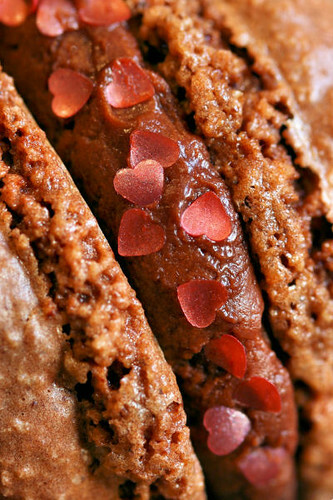 These little macs are filled with chilli chocolate ganache, and dusted with edible fairy hearts. This recipe uses 1 egg white and makes about 14 halves, 1½" across. Mix the ground almonds, icing sugar and cocoa powder together in a bowl and put to one side. In a large clean, dry bowl, whip the egg white with a pinch of salt until it becomes foamy and stiff. Gradually add the granulated sugar, whisking well after each addition, until the mixture is stiff and shiny. Gently fold in the almond mixture using a large spoon or spatula, until incorporated. The mixture should be shiny and firm, but with a bit of 'flow' to it. Don't over-mix it or it will be too runny. Fill a piping bag with a 1cm round tip and pipe the mixture onto Silpat or baking parchment - you can put a circle template underneath your Silpat or parchment paper as a piping guide. Tap the sheets gently to remove air bubbles. Leave to dry at room temperature for about an hour or so before baking. Bake in a preheated oven, 160º/325F for about 15 to 20 minutes, depending on their size. Remove from the oven and leave to go cold. Peel off the Silpat or baking parchment. Melt the chocolate and leave to cool a bit. Whip the cream until stiff and gently whip in the cooled chocolate. Pipe or spoon onto one half of the macarons, and top with the other half. Spoon the edible hearts onto the cream and serve. Don't forget to look at all the other macarons that have been made this month by heading over to the Mac Tweet blog! For a moment, I thought the hearts were shaped from chilli flakes! Beautiful macarons, Nic, and love the decoration. 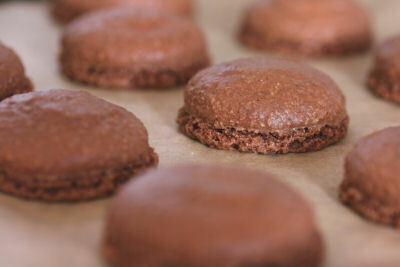 Chilli + chocolate = macarons with lovebites! Thanks for joining us and spreading the mac-a-choclat l♥v!! Love the idea you used whillie chocolate. Those little hearts are gorgeous! Mine are chocolate too this month and I actually got feet finally so can dare to go forward and try more adventurous flavours at last! Need to go and take pictures of mine now and post quick! Imagine if those hearts were chilli flakes? LOL!!!!! Beth - you can get the edible hearts in Hobbycraft or Lakeland. OMG, beautiful macs and photos and the chocolate and chili flavor sounds wonderful. Amazing, amazing job! Such perfect little bites. 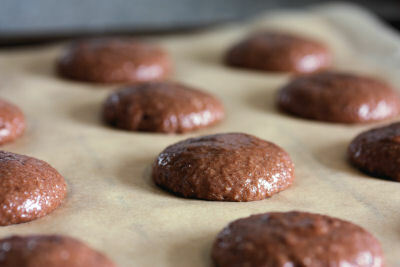 One day I'll muster up the courage to try making macaroons! Wow they look amazing Nic! Oh wow these look and sound heavenly and I adore the tiny red hearts. You have an award waiting for you at my blog. Beautiful macarons! Perfect for Valentine's Day! These are real stars, they look so good and I love the chilli twist of course. What a beautiful mac with a fun and different flavor! Your picture with the tiny hearts is just stunning. nic i missed these!! but chili and chocolate rock - these look lovely! Good heavens - you are a macaron machine! That Lindt chocolate is lovely enough straight from the wrapper and I imagine it would make awesome macarons. Gorgeous! Could these sound any better? Or be any more beautiful? Amazing! Chocolate Covered Ritz Crackers for Nutella Day!